We are a long way past Post #72. Downtown Section of the State Capital City of Michigan. 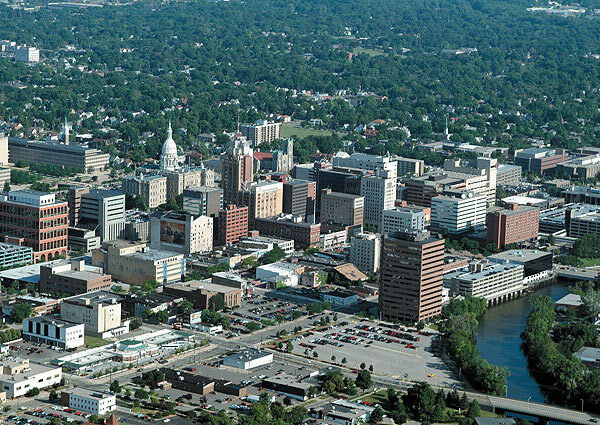 Downtown Lansing, Michigan, still exists. It seems they have perhaps built some new buildings, while tearing down some of the old ones. But, the place is still fairly recognizable. The loading of boxcars on the boats of the Pere Marquette line at Ludington, Michigan, no longer occurs. The whole concept of ferrying rail cars across Lake Michigan died out during the 1970s and 1980s. If you look carefully at the postcard, you can see that the name of the rail ferry is the Badger. 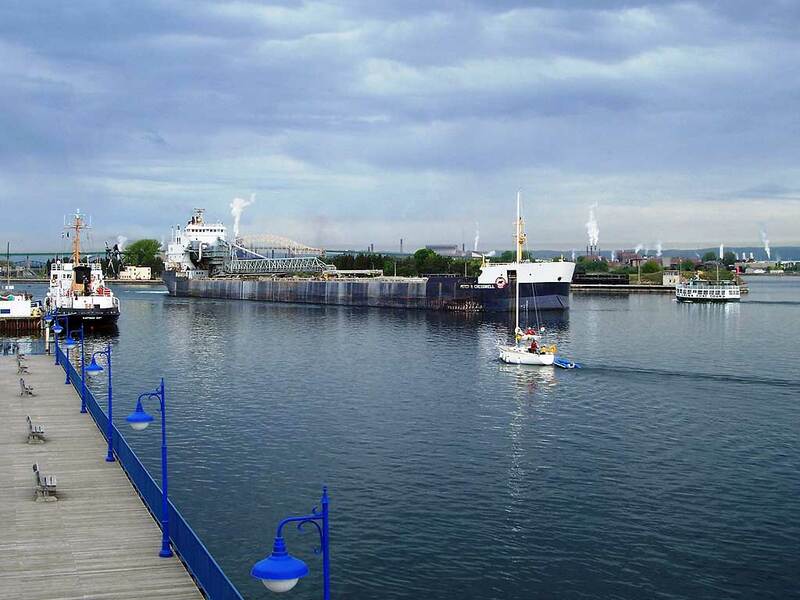 It so happens that the SS Badger stuck around to the bitter end, and was the only Lake Michigan rail ferryboat still in operation from 1988 to when the very last boxcars floated across in November 1990. Even then, the collapse of its raison d'etre could not deter the intrepid Badger! As you can read on its surprisingly comprehensive Wiki page, the boat returned to service after an extensive retrofit, and now serves as an automobile ferry between Ludington and Manitowac, Wisconsin. So here is the same boat, in roughly the same place, 50 years or so later. No boxcars. Interstate Hy. 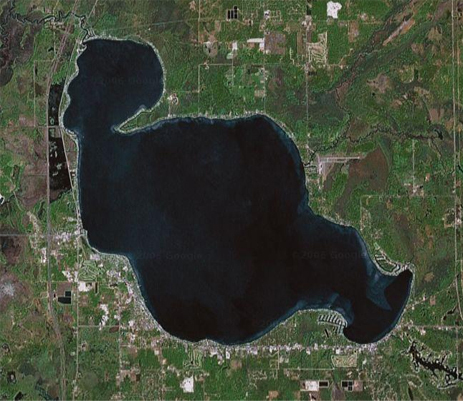 75 which runs from Canada to Southern Florida, is shown here west of the Police Post, Houghton Lake, Michigan. Interstate 75 is still there. Houghton Lake is still there. The Police Post is still there. It was recently redesignated Post #72 in a reorganization of Michigan's State Police system, although several online sources still refer to it by its former name, Post #75. Tour Boat BIDE-A-WEE in the Mac Arthur Lock. The Soo Locks are certainly still there. And surprisingly, the tour boat BIDE-A-WEE seems to still be in operation. Here's a 2009 photo from the "boatnerd.com" website (really) that identifies the BIDE-A-WEE as the craft on the right hand edge of the image. Moreover, the folks at "shipbuildinghistory.com" (really) list the good ship as still active on a web page updated in April of this year. It is likely operated by these folks and may indeed be the tour boat pictured under the caption "Ride With the Freighters." The Lakeside Inn -- but isn't it marvelous how you can find the tree and even the umbrella table from the first postcard in the background of the second? I love that. But in any event, the Lakeside Inn Resort is still there. Tell them Michael5000 sent you! May I say, best title of a Wednesday post ever. Ever. I state that without equivocation.